It's Not Work, It's Gardening! 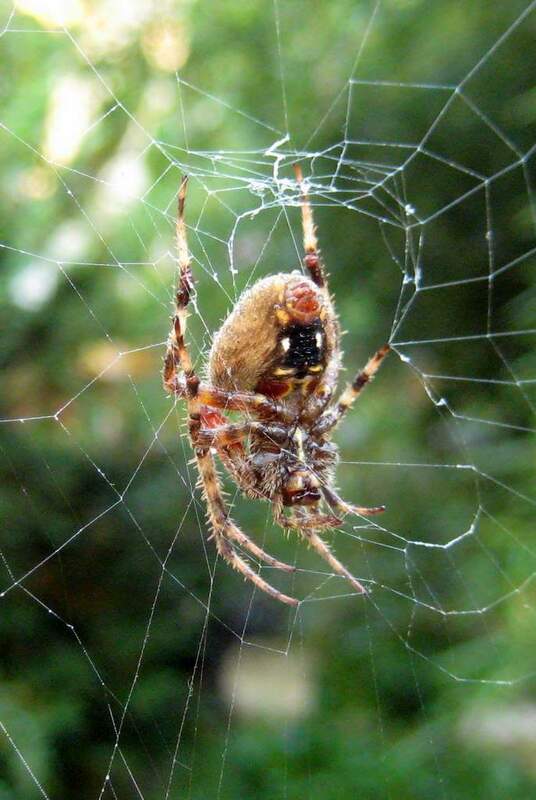 : Ever walk into a spiderweb? 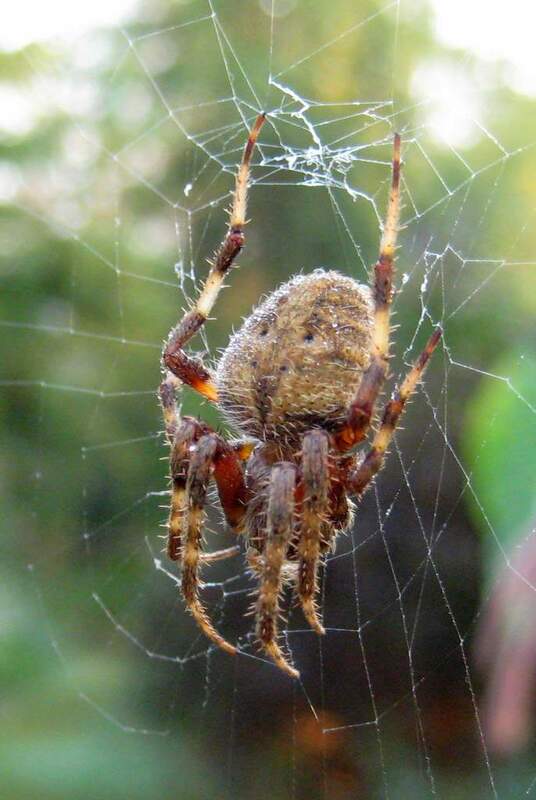 Ever walk into a spiderweb? As Halloween approaches, people are decorating their houses. There are fun decorations, scary decorations, and those that fall somewhere between the two. The fake spiderwebs that people stretch over bushes are in that category for me. They're supposed to be scary, but they're really not. For one thing, they don't look like real spiderwebs -- they're kinda like webby fleece that's been stretched around. The main reason they don't produce any anxiety in me though, is that I've walked into real spiderwebs before. I've done it enough times that it doesn't induce panic anymore. I once got a web full in the face -- covered my glasses, mouth, everything. 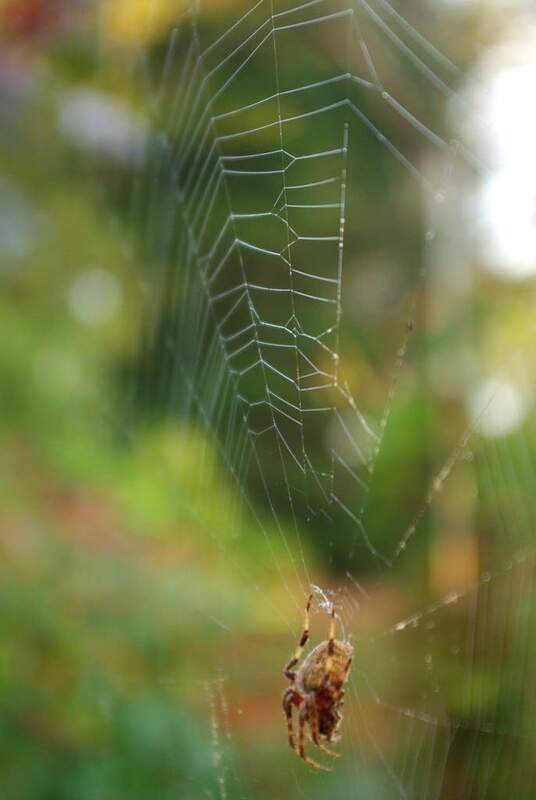 The last few days I've walked into this spider's web at least three times. Now, you might be wondering how I managed to walk into the web even once, let alone three times. 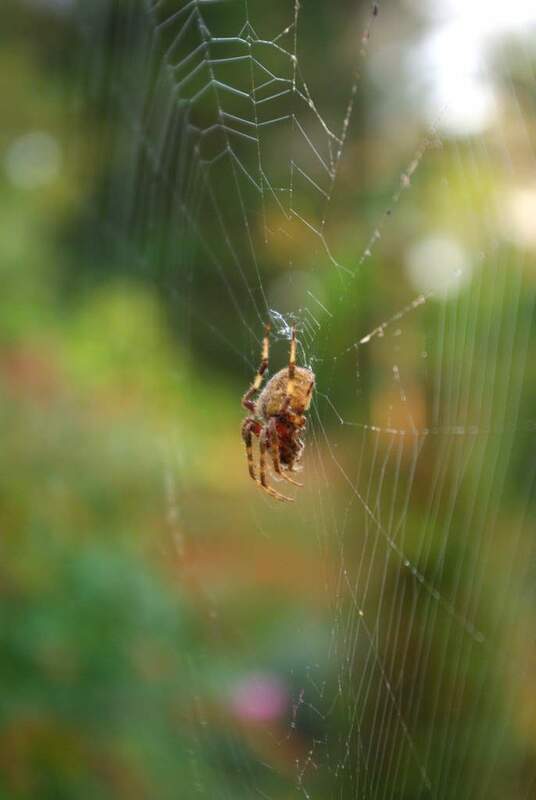 The spider built its web right across the patio, just in front of where I created the new stone walkway last month. I noticed the web the evening before I walked into it, and thought to myself "I need to remember this is here so I don't walk into it". Of course in the morning I groggily made my way down the steps, across the patio, and right into the web. 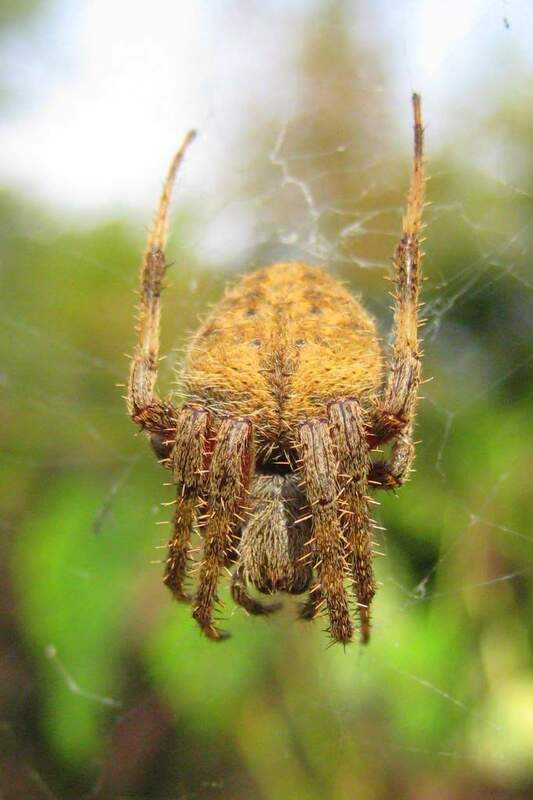 Luckily the spider wasn't in the center of it at the time. The split second after sensing the sticky strands is a tense moment for me -- it's when I stand perfectly still, hold my breath, and hope that I don't feel anything crawling on me. When all remains still, I take a careful look down onto my chest just to verify that I'm spider-free. I haven't had that spider-upon-me experience yet, although I suspect that I will not handle it as well as I might. There may be some yelling and involuntary flailing of limbs. 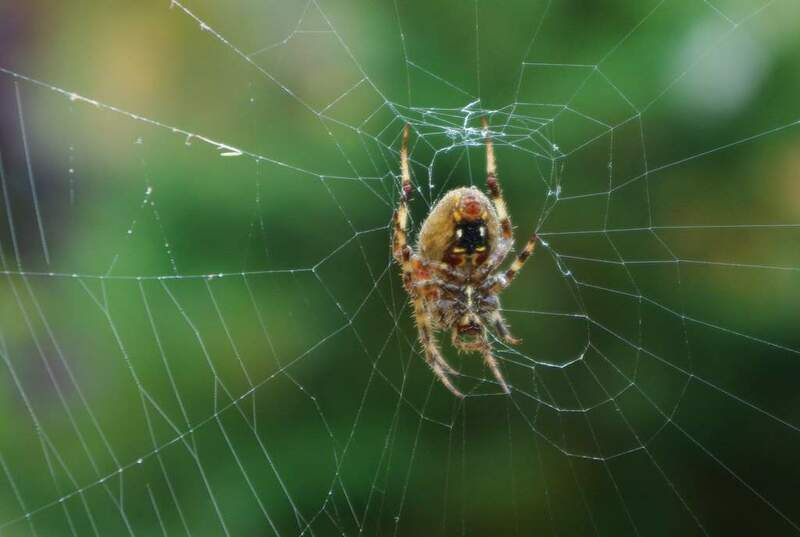 I think that if the spider were sitting in the middle of the web I would notice before I got too close, and would therefore avoid walking into the web at all, so it makes sense that the spider never ends up on me. At least that's how I rationalize it. The next morning I avoided the web area completely, taking a different path into the back of the yard. Smart, right? Well 15 minutes later I walked into the web coming from the other direction, although I stopped myself and was able to back up without causing too much damage to the web. 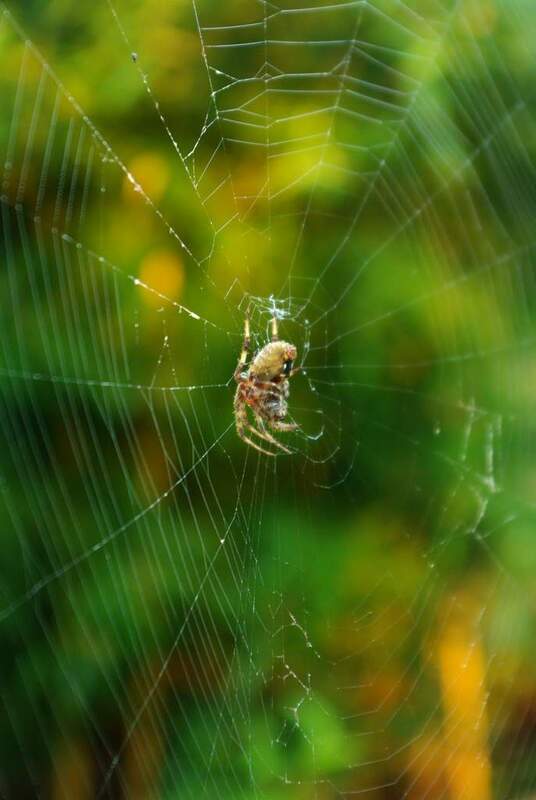 So fleecy fake webbing stretched across bushes -- not scary! Big, spiky garden spiders in almost invisible webs stretched across the path -- that would have me a little anxious. Unless you're handing out Kit Kats on Halloween. In that case no puny spider is going to keep me from the loot! funny story at the end. i liked reading your post. yes i hate walking into webs, always scared that the spider is on me somewhere!